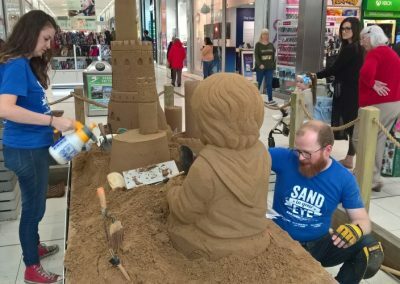 The Sand House Charity would like to extend its grateful thanks to the managers of the Frenchgate Shopping Centre for the wonderful and valuable support that they gave to this project. 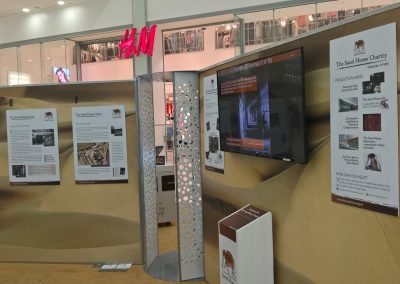 At the end of the six-week run, we calculated that approximately 4,000 people had engaged directly with the exhibition. 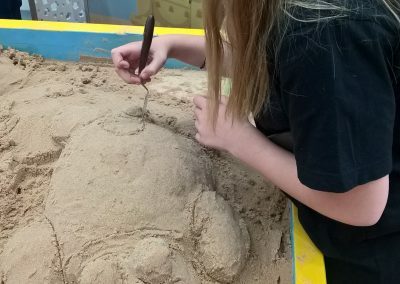 They had done this through either reading story boards or watching the video, or both. 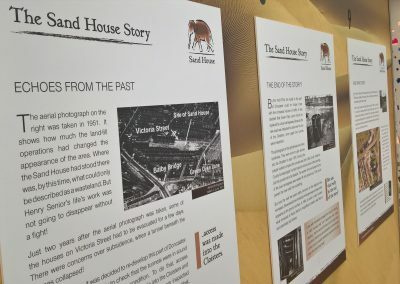 Feedback obtained by our volunteers indicated that many of these people had little or no prior knowledge of the Sand House. 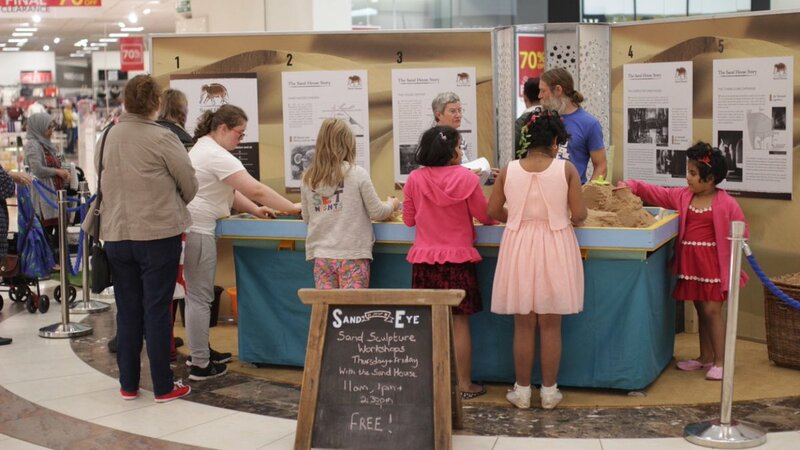 The sand art workshops were extremely popular. 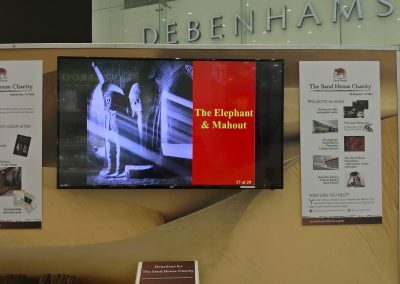 Around 40 participants agreed to fill in a simple questionnaire afterwards, including scoring various aspects out of 10. 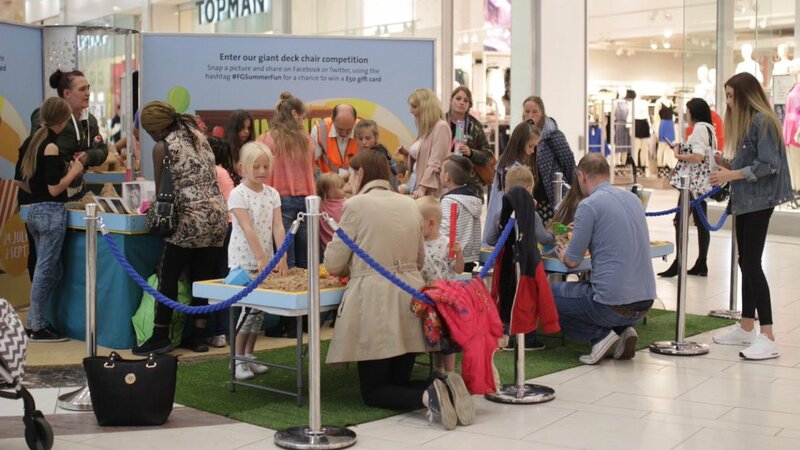 The average score across all the completed questionnaires was 9/8 out of 10. 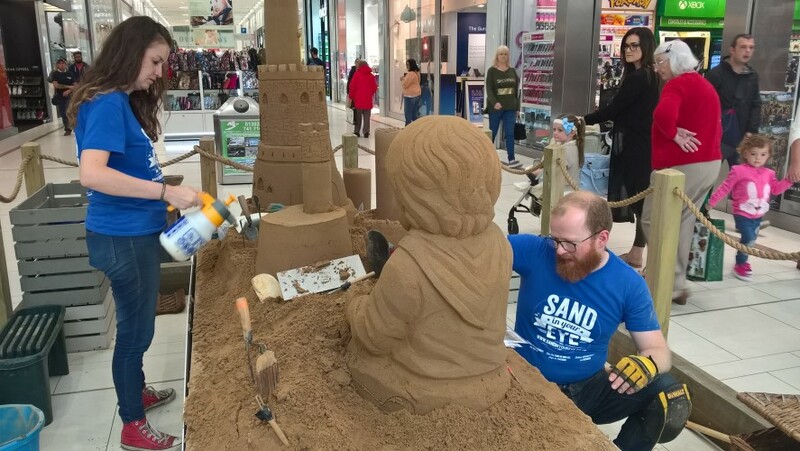 The sand sculpture created a wonderful talking point and was very eye-catching. 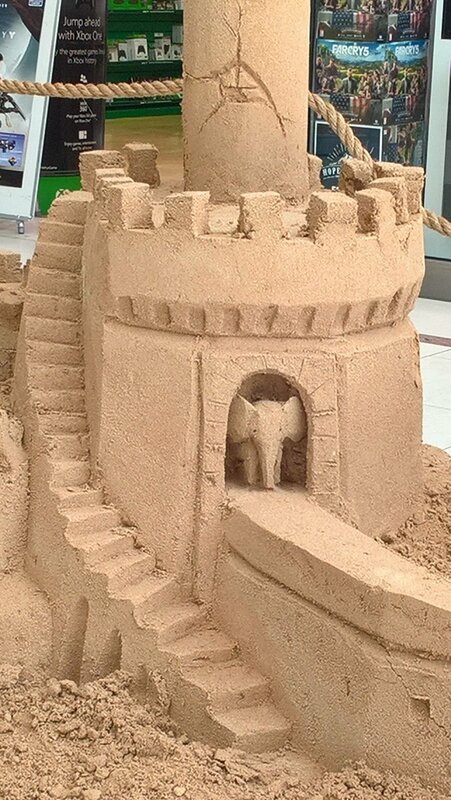 Sadly, it survived for only 3 weeks, before it was vandalised beyond repair by a mindless hooligan. 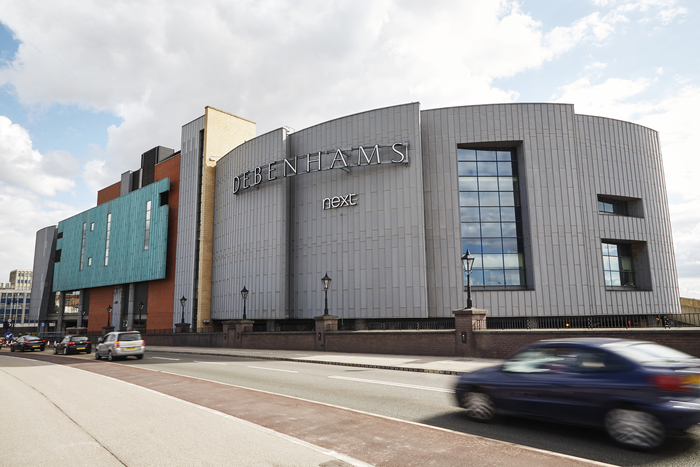 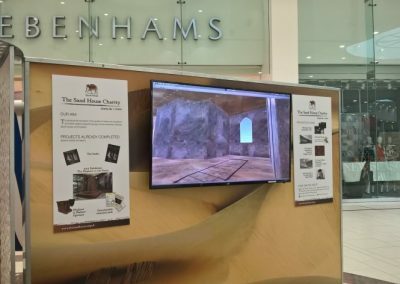 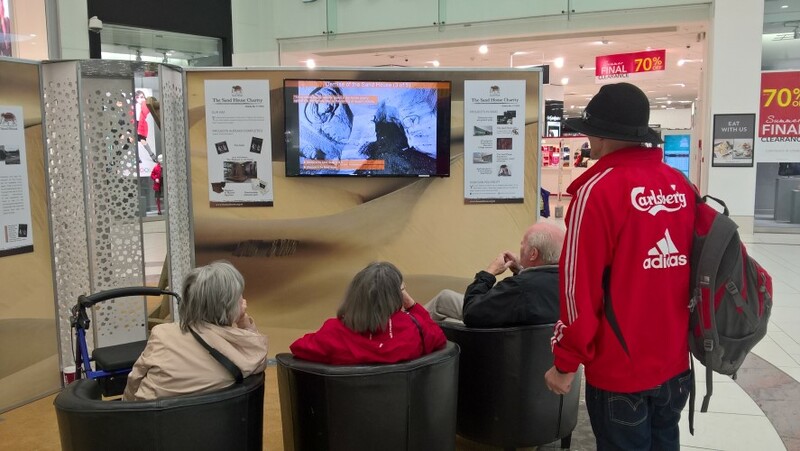 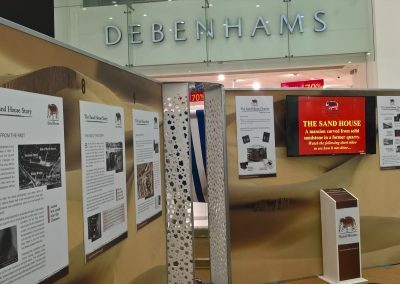 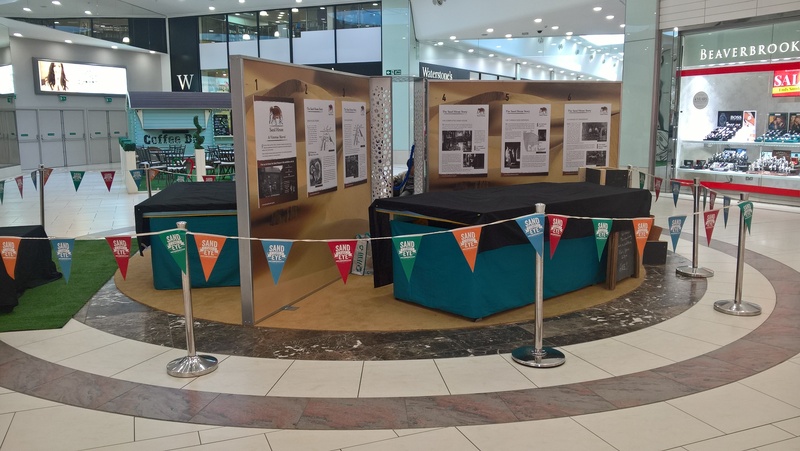 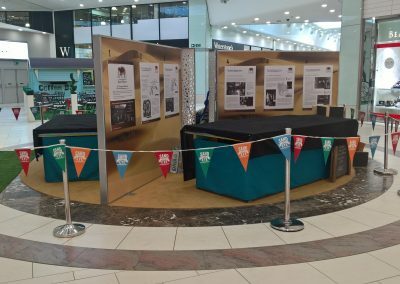 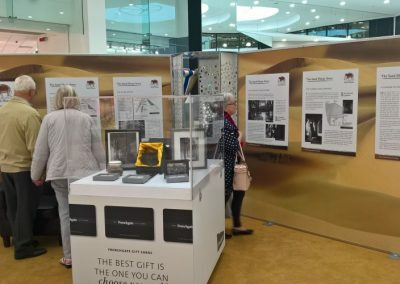 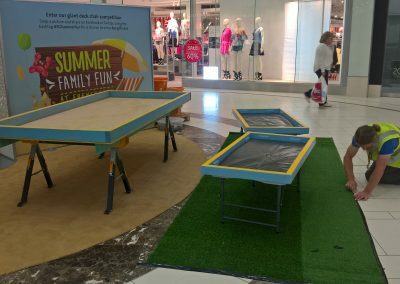 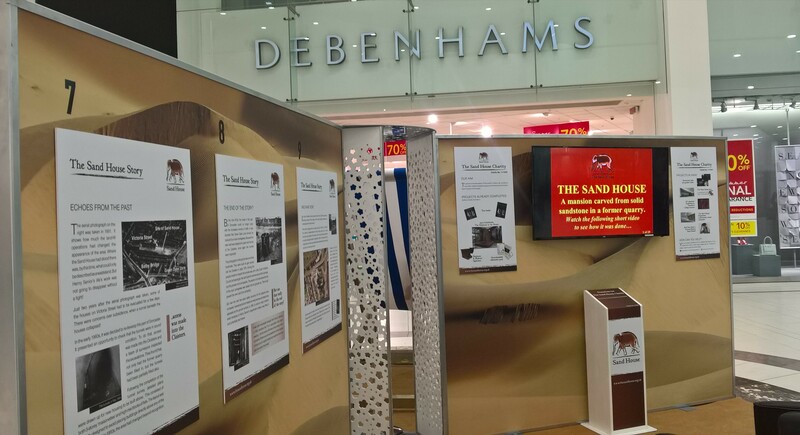 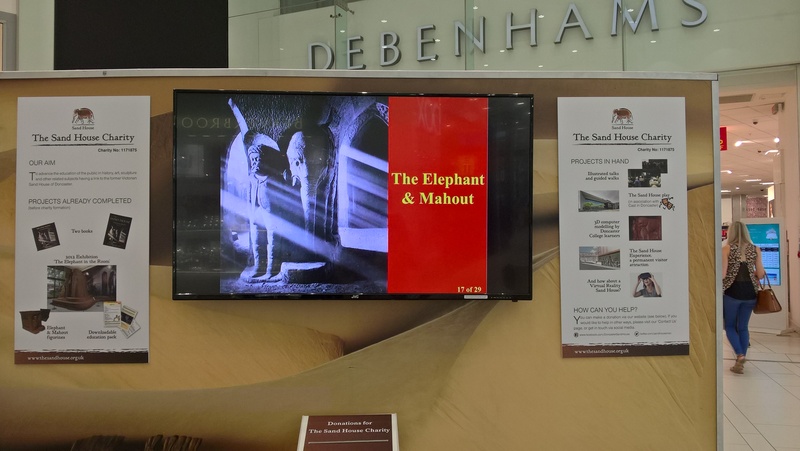 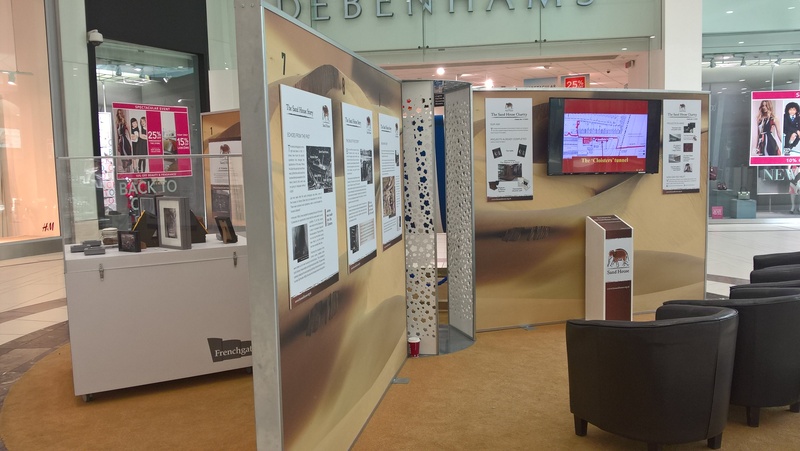 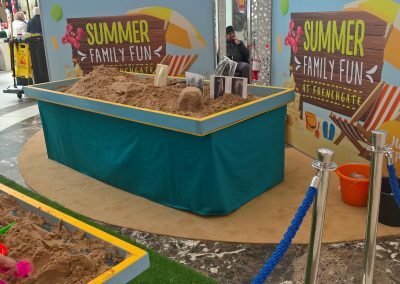 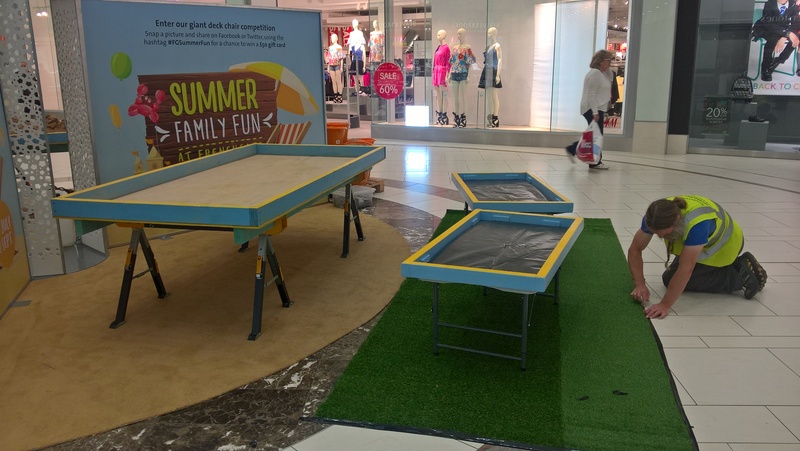 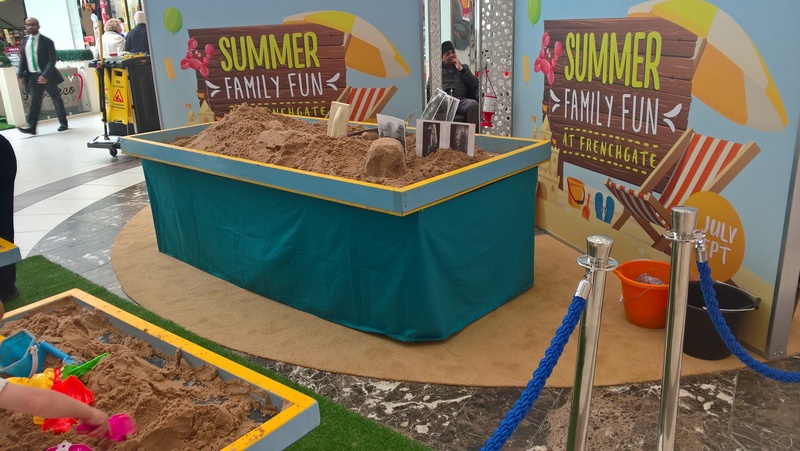 Located in a prime spot, just outside the Debenhams store, the Sand House exhibition occupied two-thirds of what is known as the ‘event pod’. 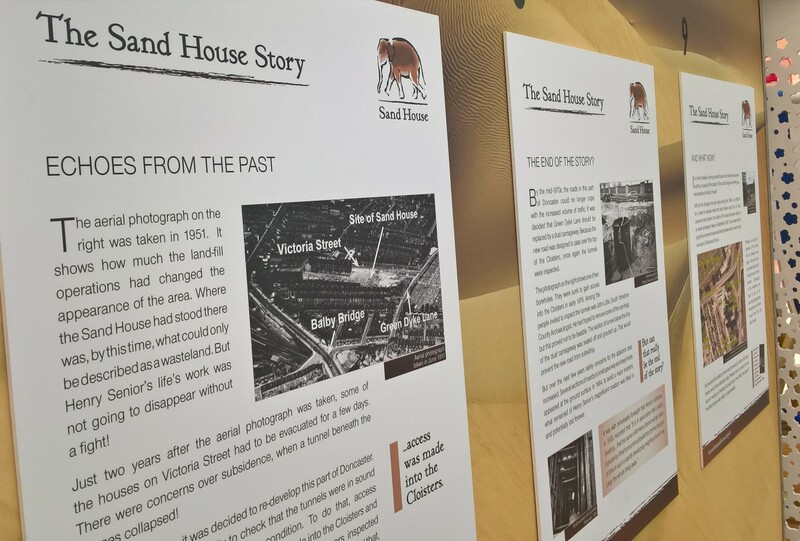 On the vertical faces of the event pod we displayed nine story boards, briefly telling the Sand House story. 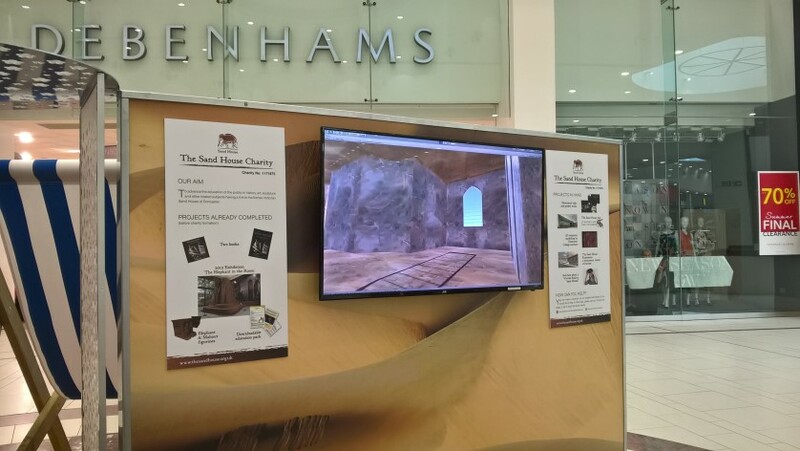 We also had a digital display screen running continuously, showing a looped video of images. 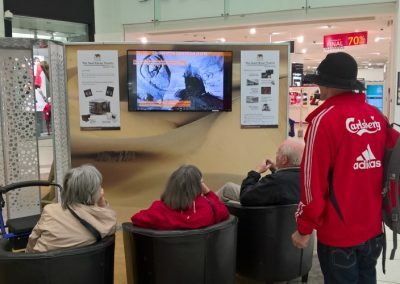 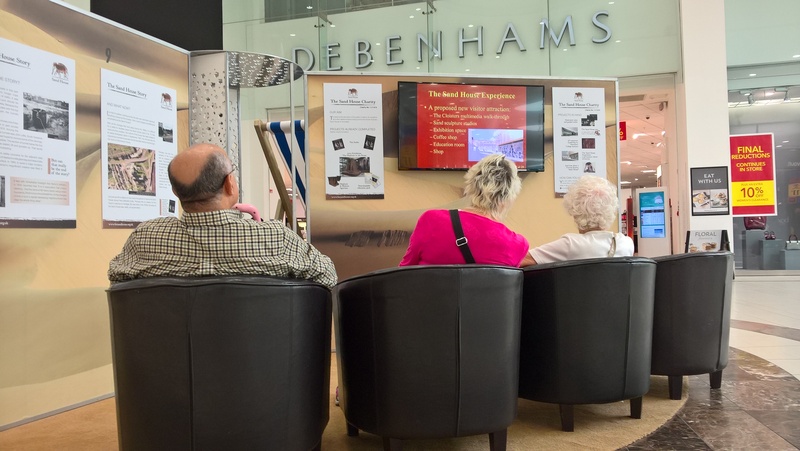 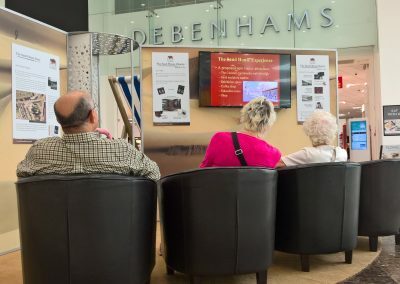 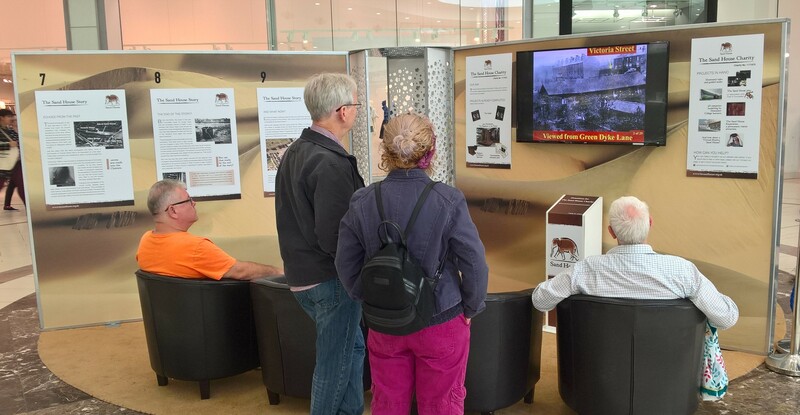 This proved to be a popular attraction, with many people taking advantage of the seating to view the entire 23 minutes of video. 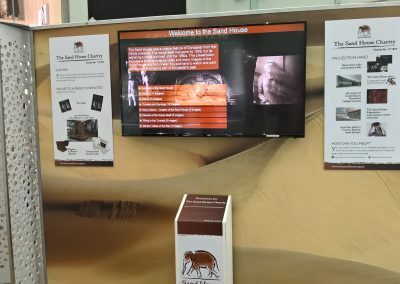 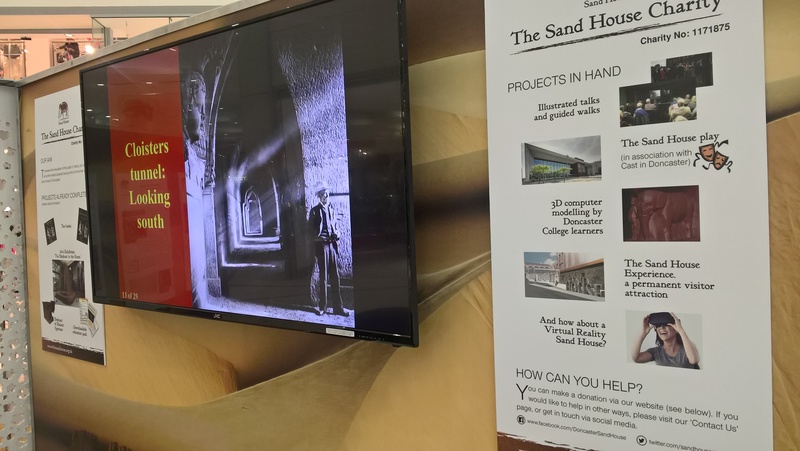 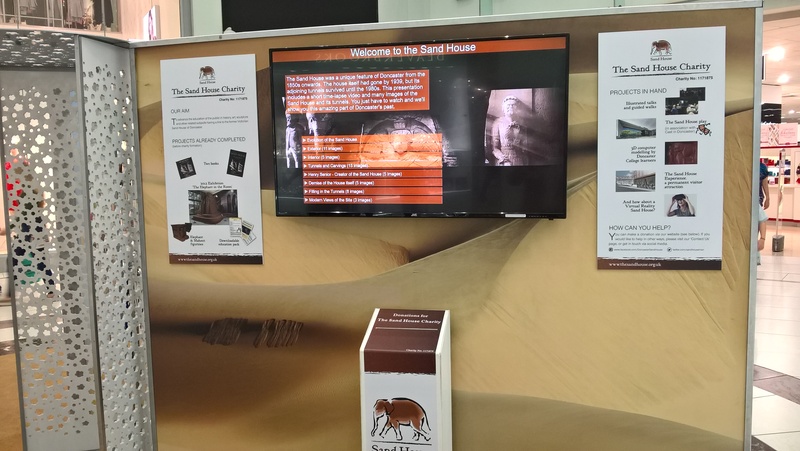 At either side of the digital display screen were information boards describing the work of The Sand House Charity. 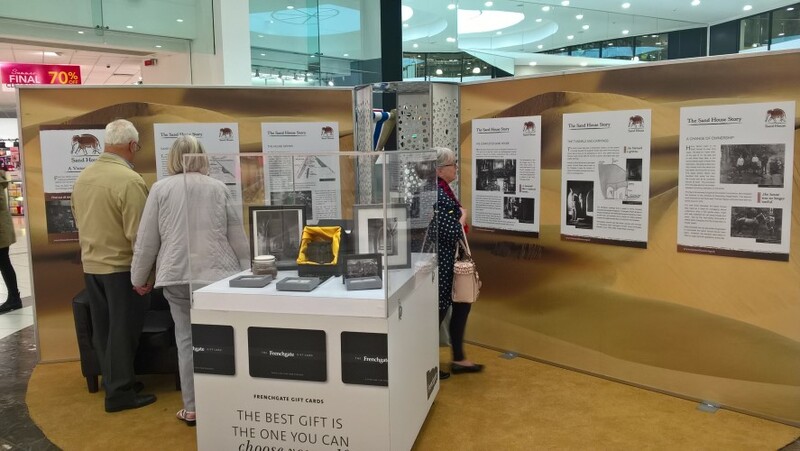 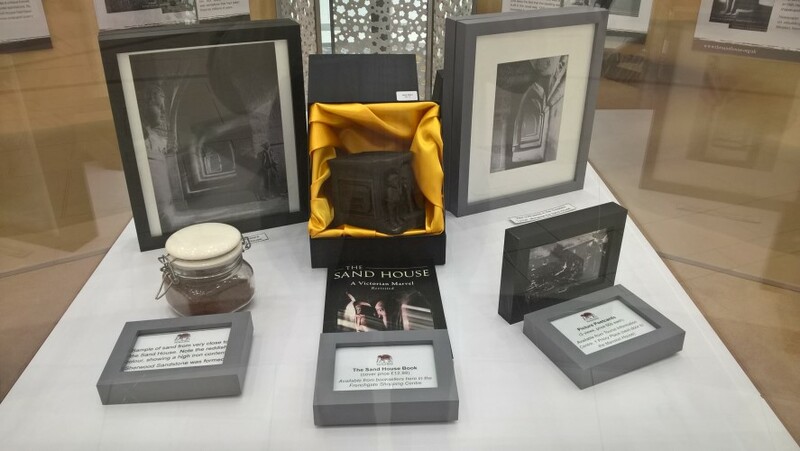 In one sector of the event pod we placed a display case, containing various images and artefacts relating to the Sand House. 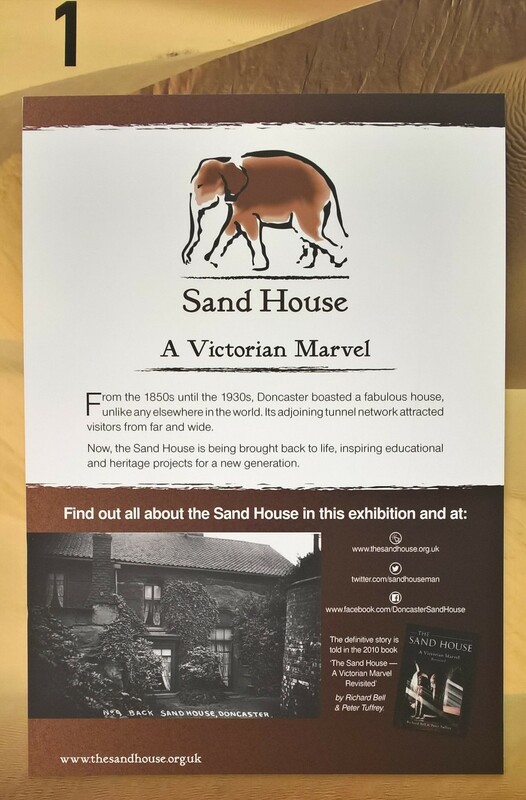 Volunteers from The Sand House Charity spent almost 60 hours manning the exhibition, at the busier times of day. 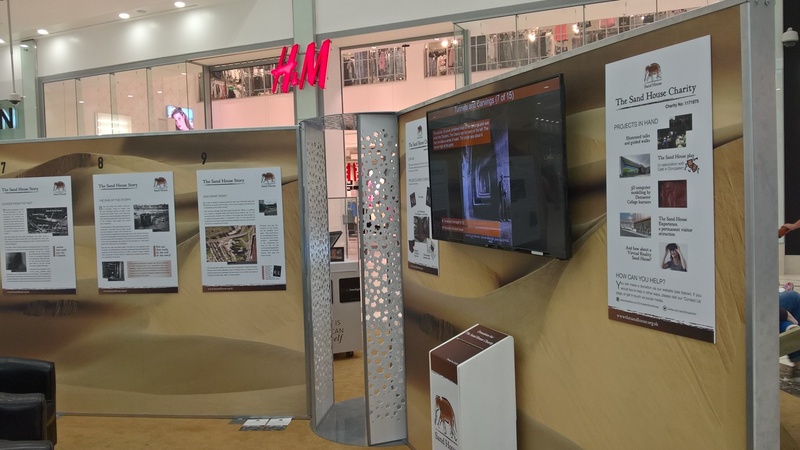 This enabled us to talk to visitors, obtain feedback and count the number of people who engaged with the exhibition. 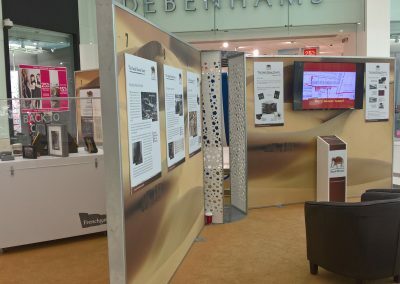 By clicking on any of the images on the left you can view a gallery of exhibition photographs. 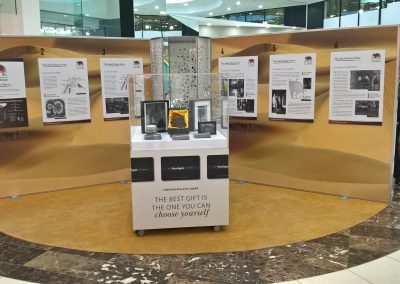 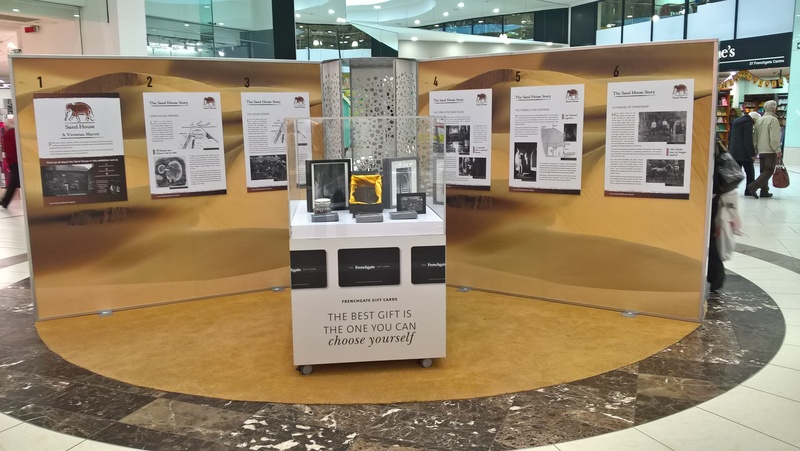 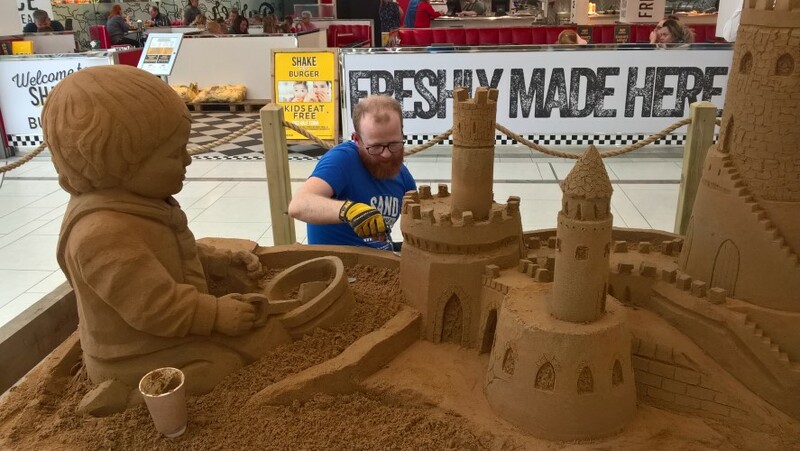 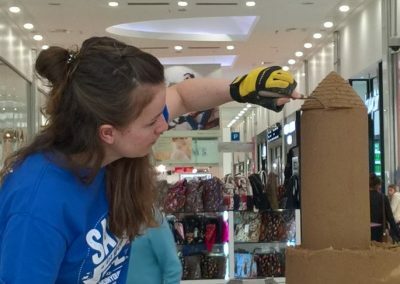 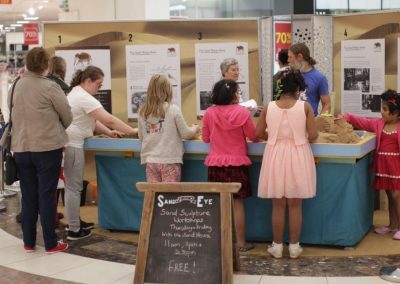 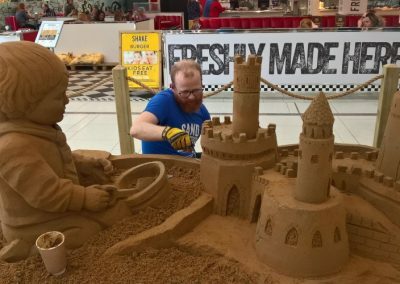 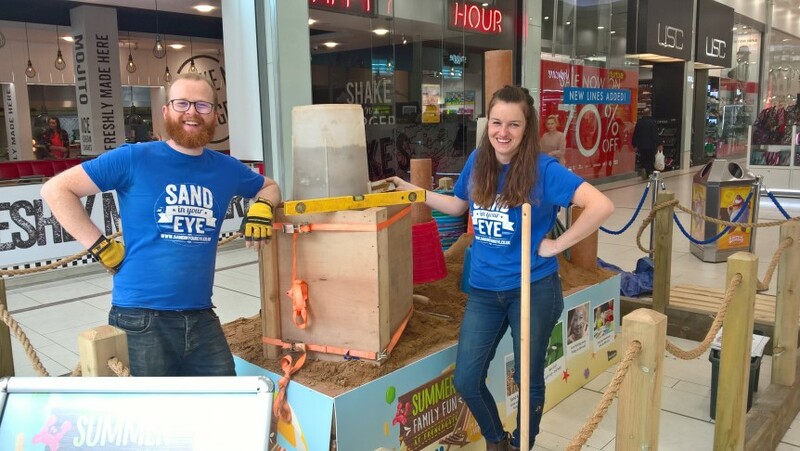 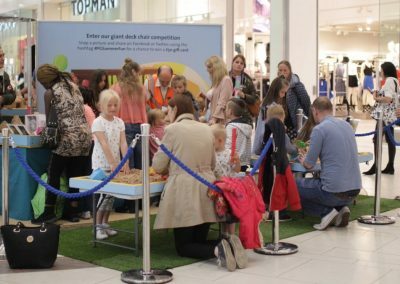 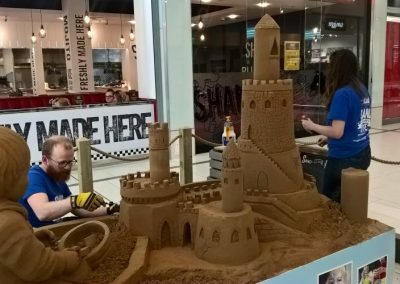 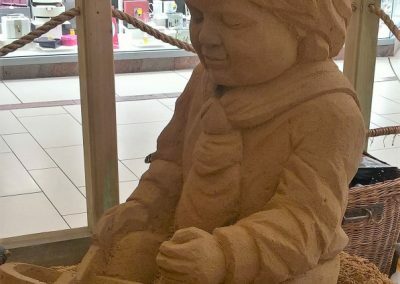 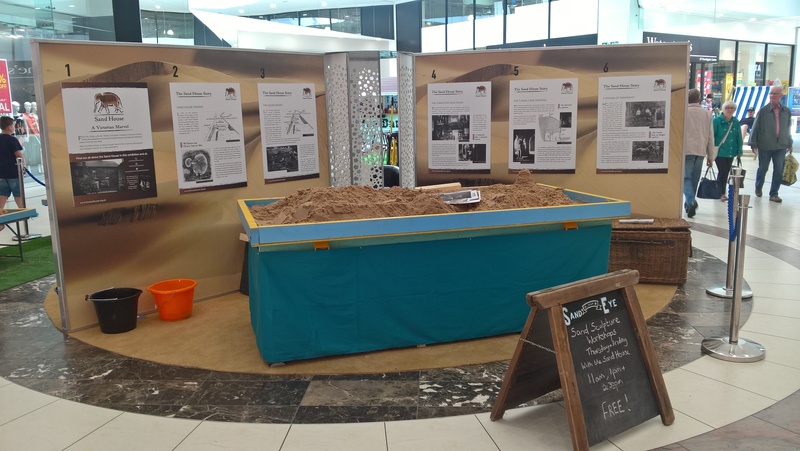 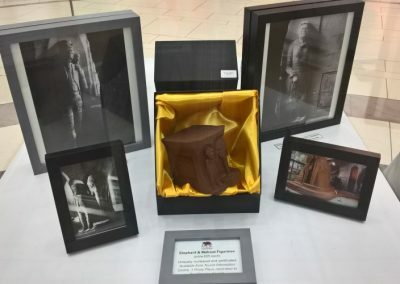 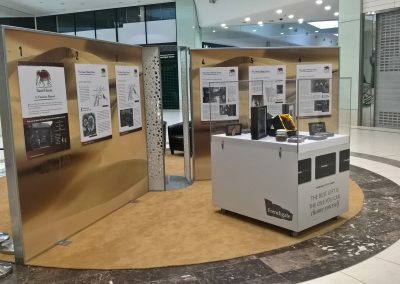 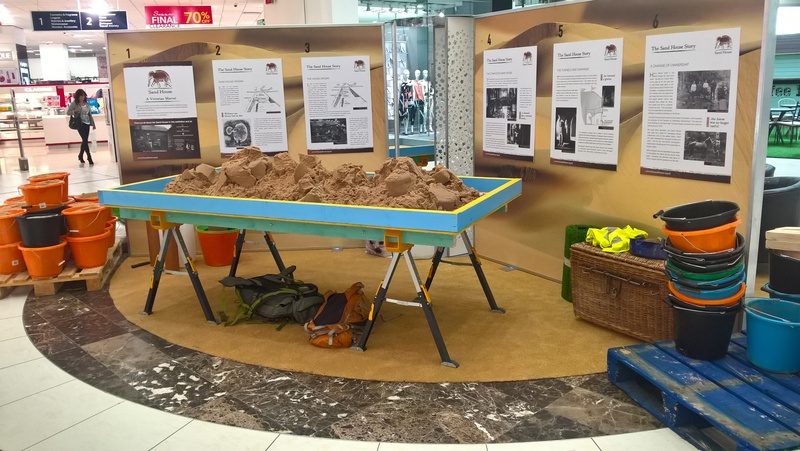 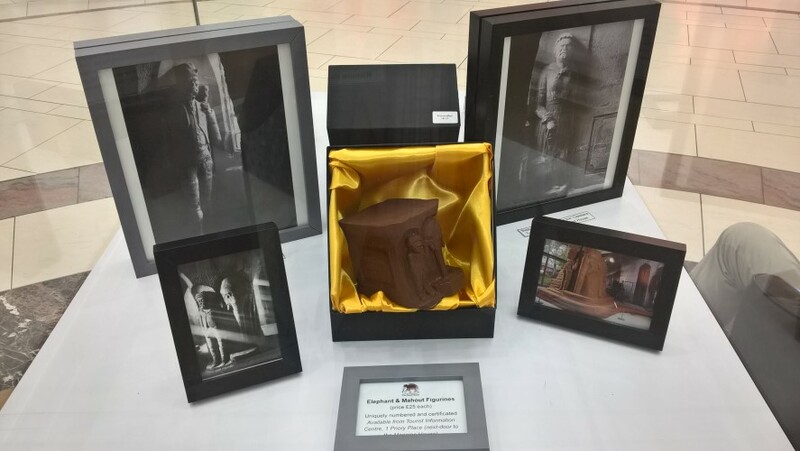 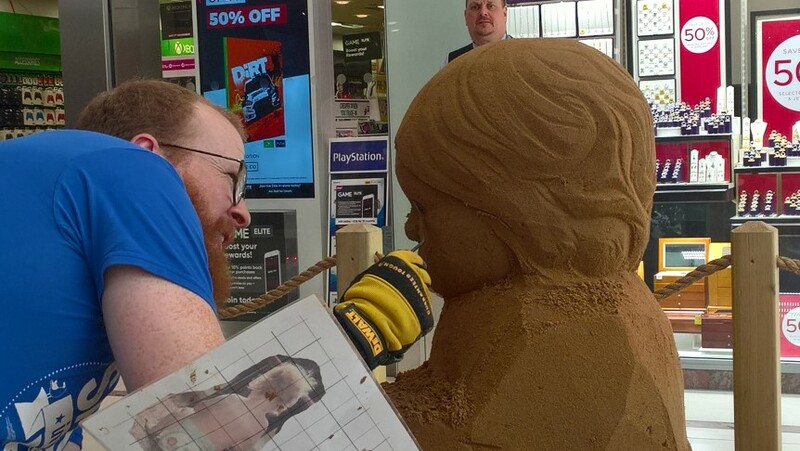 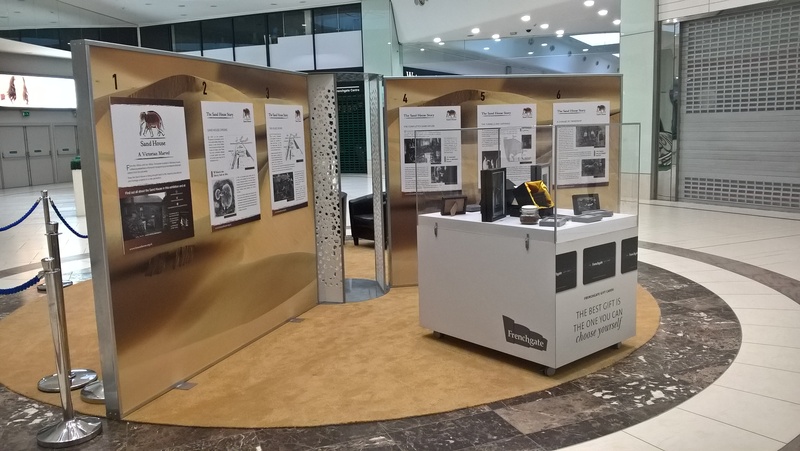 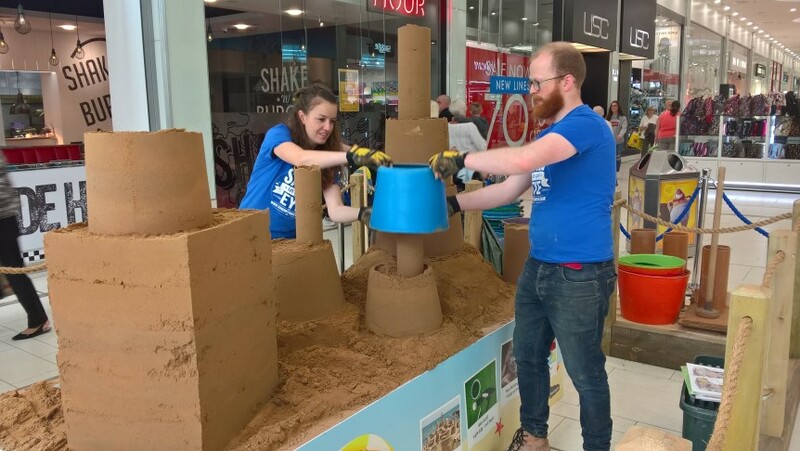 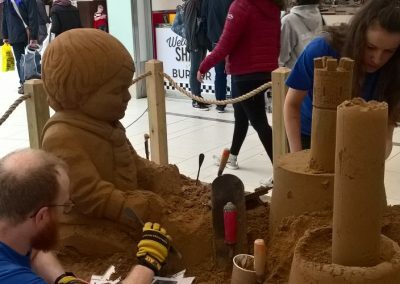 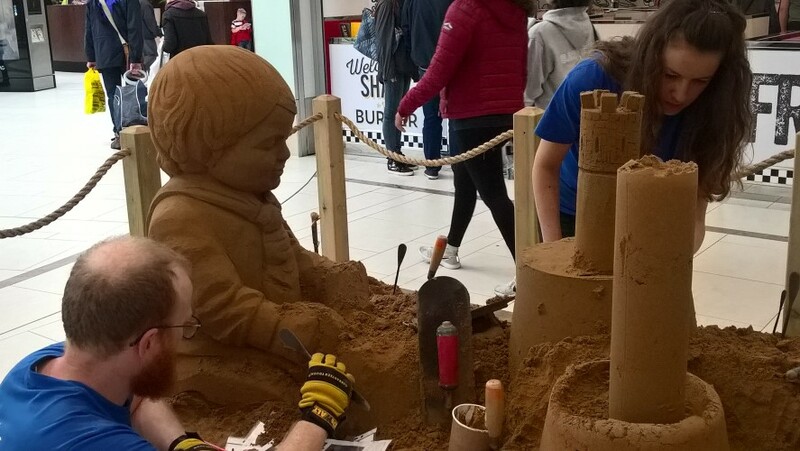 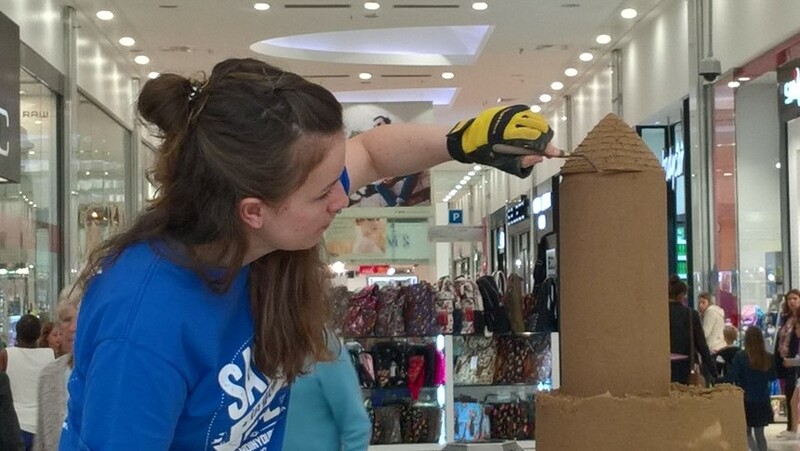 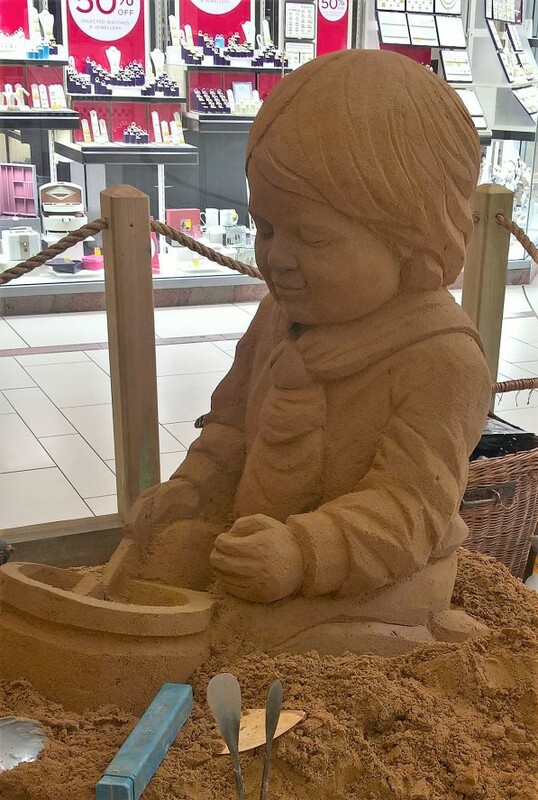 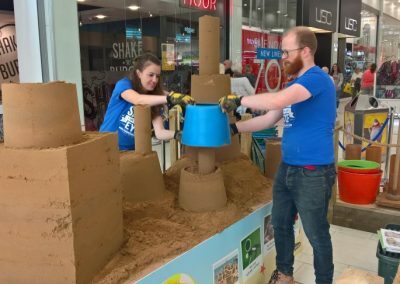 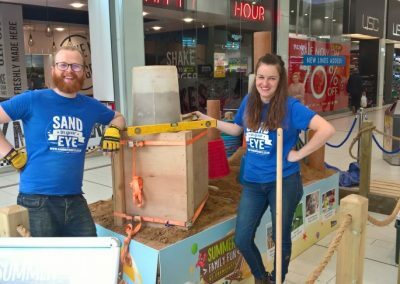 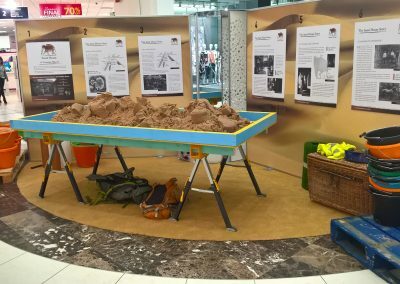 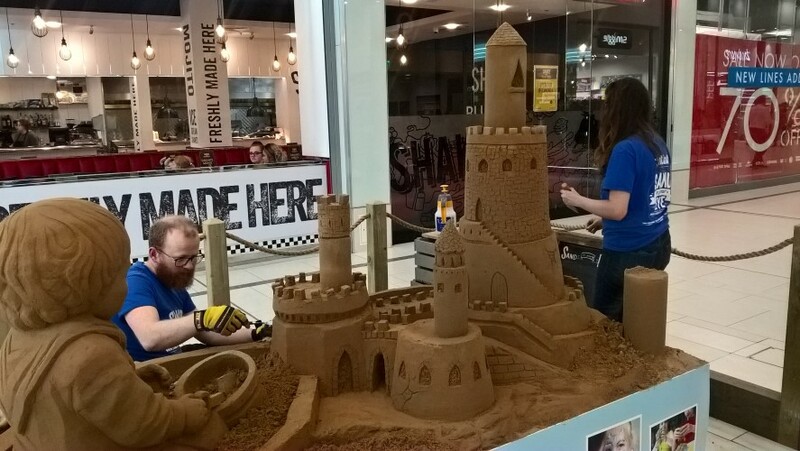 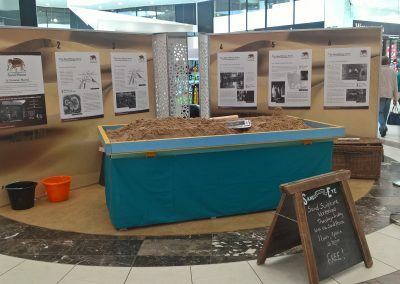 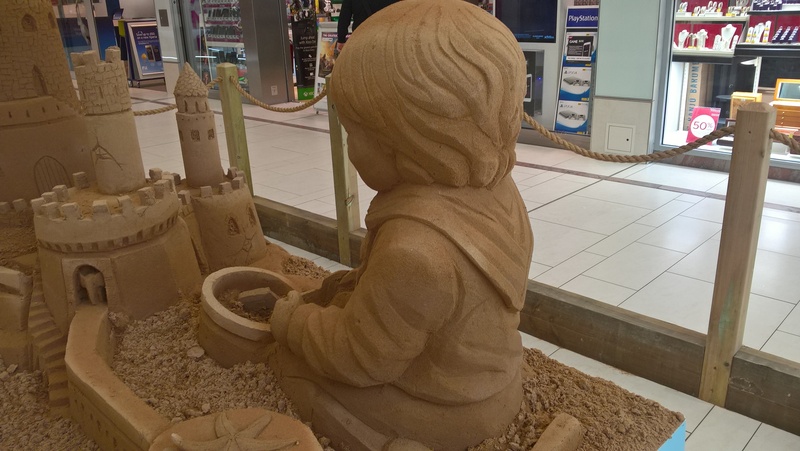 Jamie Wardley and Claire Jamieson of Sand In Your Eye spent two days creating a wonderful sculpture in one of the Frenchgate malls. 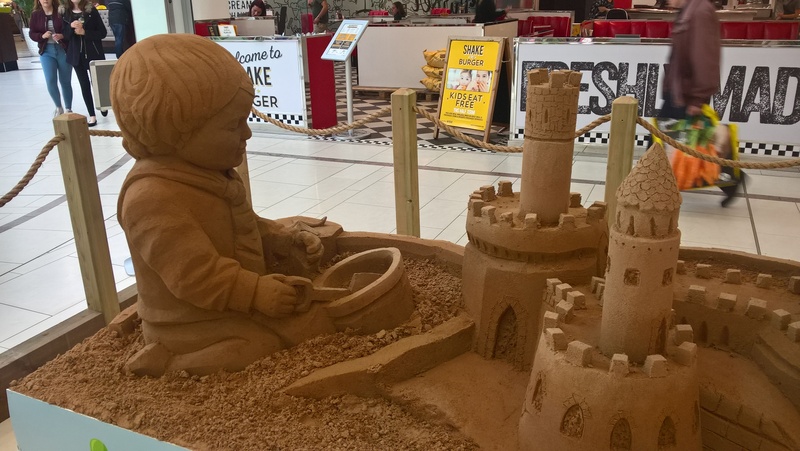 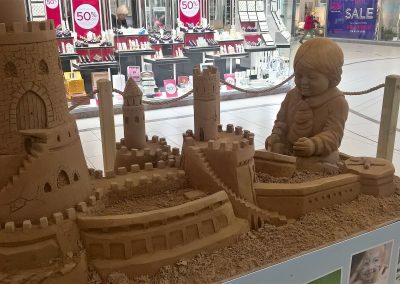 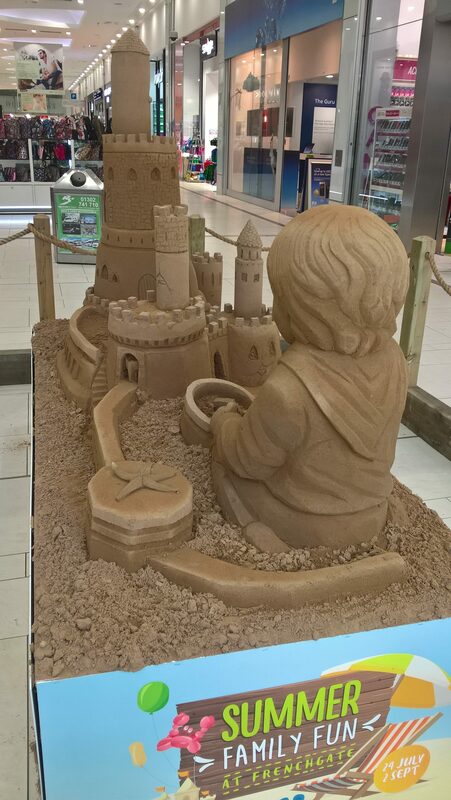 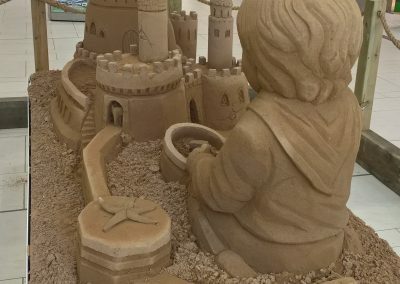 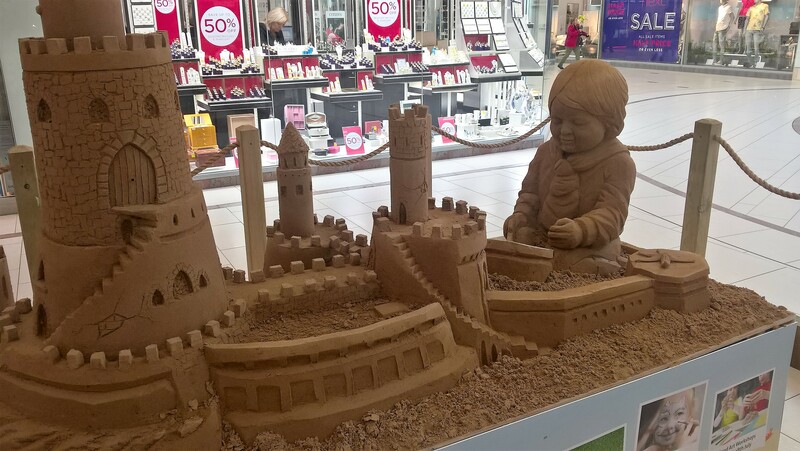 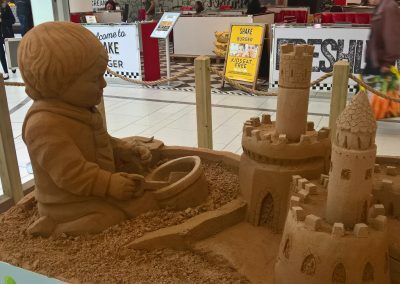 It depicts a toddler playing in the sand, alongside a fabulous sand castle. 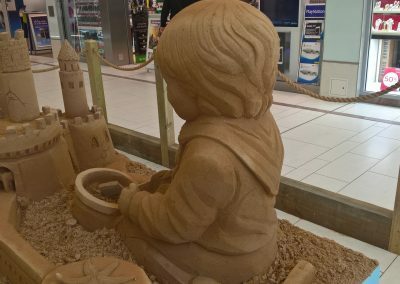 We like to think that the toddler is a very young Henry Senior, around 1830, dreaming of how one day he would create a magical house carved from sandstone, where he would live for the rest of his life! 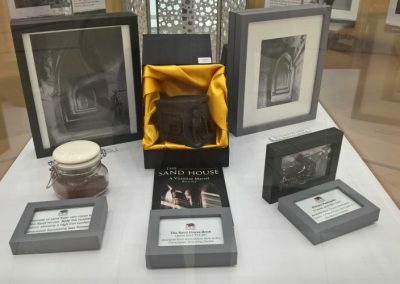 Can you spot the nod to the Sand House tunnels in one of the photographs on the right? 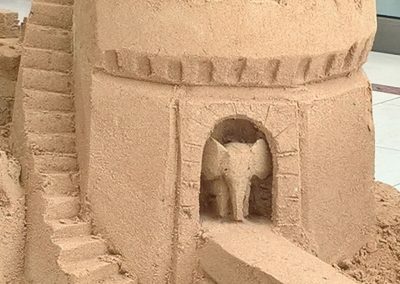 Click on any image to enlarge it and to view the entire gallery of the sand sculpture. 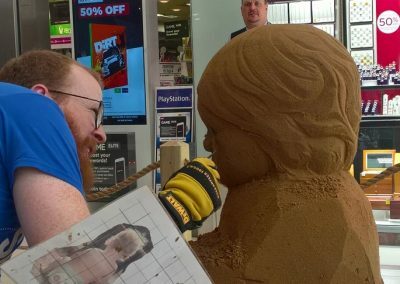 What’s that that Jamie’s doing? 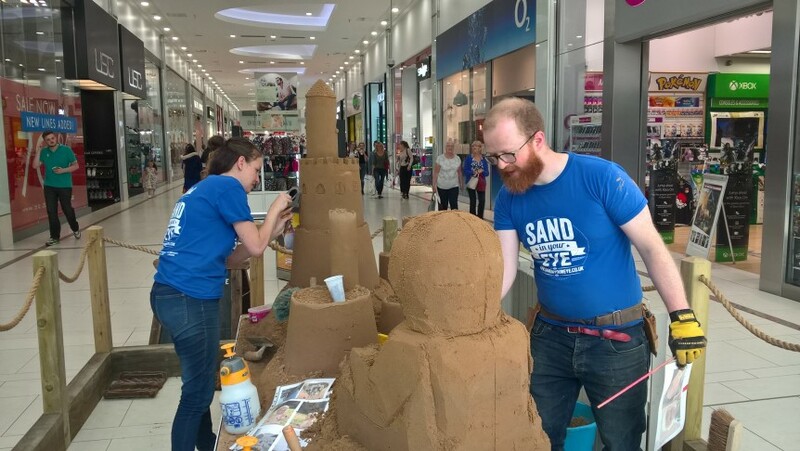 Drop in sand art workshops took place over two days in late-July. 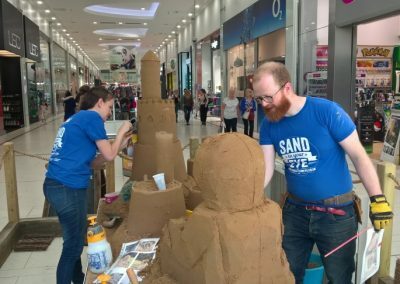 Using the purpose-built equipment provided by Sand In Your Eye, their artists, Jamie and Richard, assisted by volunteers from The Sand House Charity, helped visitors young and old to create works of art. 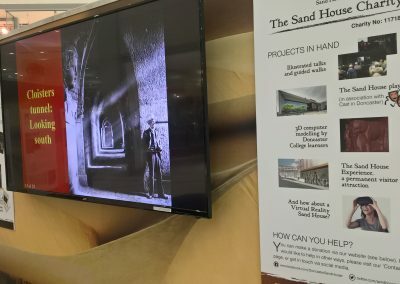 At the same time, we introduced the subject of the Sand House to those taking part. 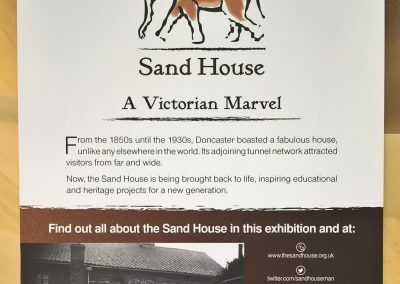 This proved to be an excellent way of engaging new people with the Victorian marvel. 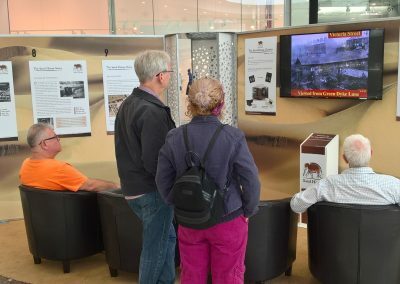 Many had never even heard of it before! 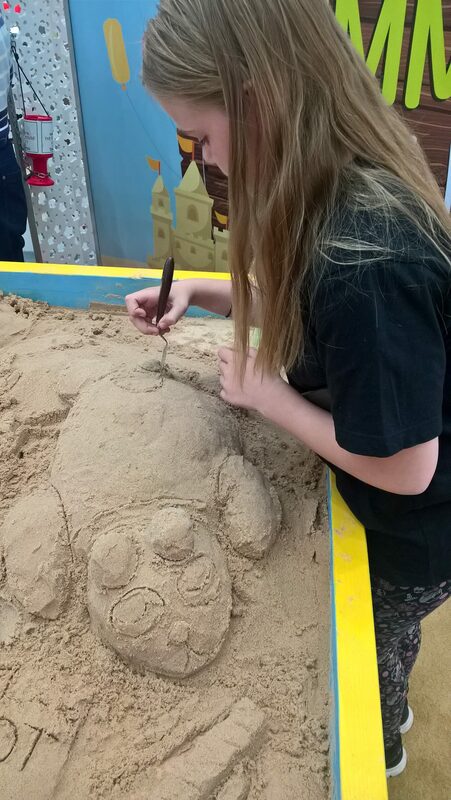 Click on any image on the left to enlarge it and to view a short gallery photographs from the sand art workshops.